A pet door can be a great gift for you, and your pet. As dogs and cats (along with a variety other animals) have become more and more like family members, they spend a greater amount of their time indoors. Regardless of whether a pet was bred for indoors, or just learns to adapt to the indoor life style, few things bring them more joy than the freedom to romp across the yard and explore the outdoors; both visually and with their nose which can read the many scents like a journal of what’s transpired since their last visit. While out there exploring, they also usually have some personal business to take care of that is better conducted outdoors. As much as we enjoy spending time outside with our pets it is not always convenient to take them outside or spend as much time with them as they might like. 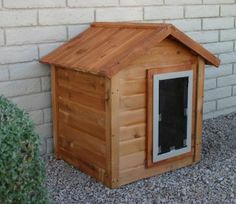 For those with fenced yards or expansive properties, adding a pet door can be a great option for you and your pet. A pet door allows your pet the freedom to come and go on their own schedule while providing you the ability to restrict it’s usage as you desire. A pet door in the back of dog house allows pet to enter the home unseen and also provides and air lock to reduce energy waste. Pet doors are readily available for most size pets and can be as simple as an opening with a plastic flap to automated electronic doors that are activated by radio frequency or magnetic sensors. They can be installed in the bottom of many entrance or garage doors or as an entirely separate pet only entrance installed through an exterior wall. The design of some entrance doors make it undesirable to install a pet door in them. For those who don’t want a pet door in their entrance door a good alternative may be a storm door that are now available with a built in pet door. If your pet has a secure outdoor area to play in and explore a pet door can open up a whole new level of freedom for you and your pet. This entry was posted in Exterior Maintenance, Windows & Doors and tagged cat door, dog door, doggie door, kitty door, pet door, pet doors. Bookmark the permalink. Pets love to have the freedom to explore their own yard. A pet door can bring your pet lots of happiness. Thanks for sharing!